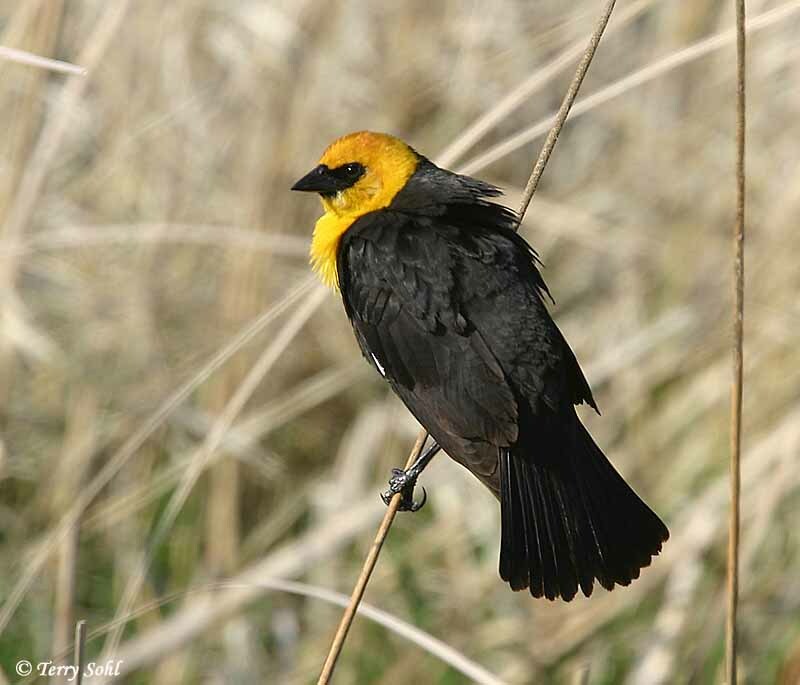 An easily identifiable bird of marshes and sloughs, Yellow-headed Blackbirds can be found throughout appropriate wetland habitat in the summer in South Dakota. 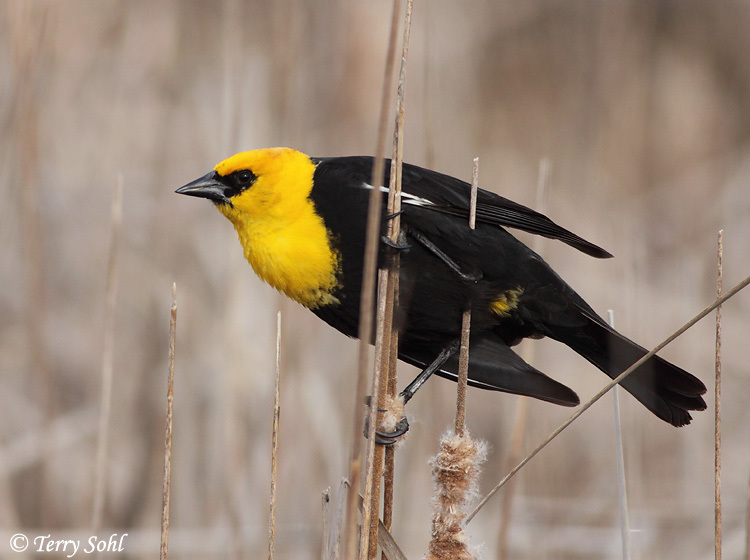 Yellow-headed Blackbirds are described by many to have the absolute worst male song of any U.S. bird. 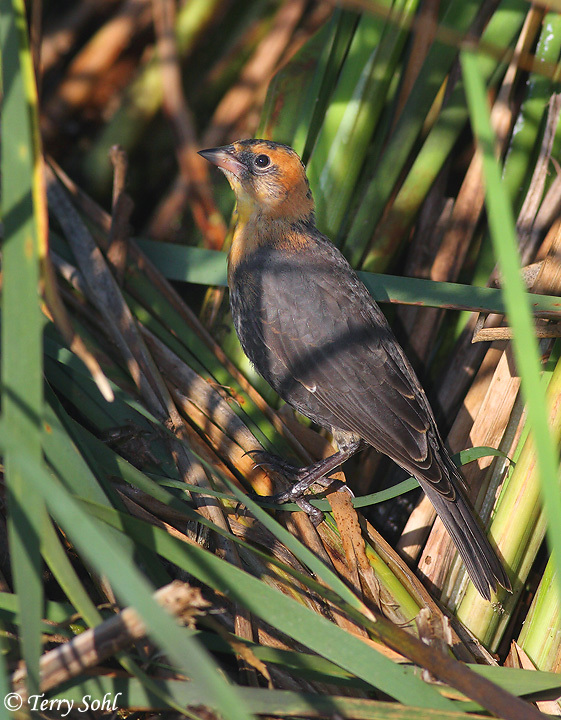 They usually nest in colonies in marshes of cattails. 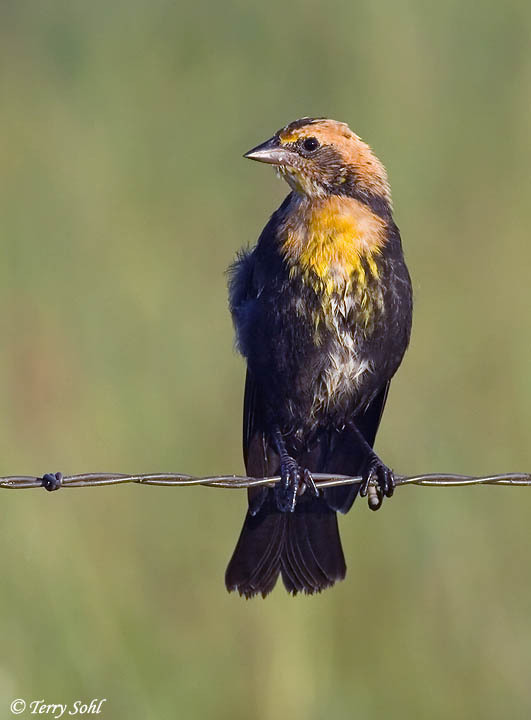 During migration and in winter, they can sometimes be found in huge flocks in open fields and pastures. 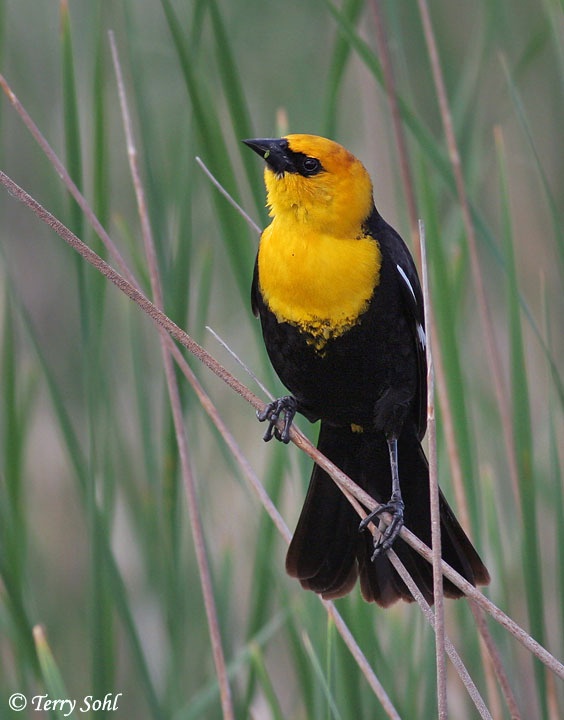 A male is pictured at the right; females are similar, but with much less vibrant yellow, and usually a dark brown instead of black on the body (see photos at the bottom). 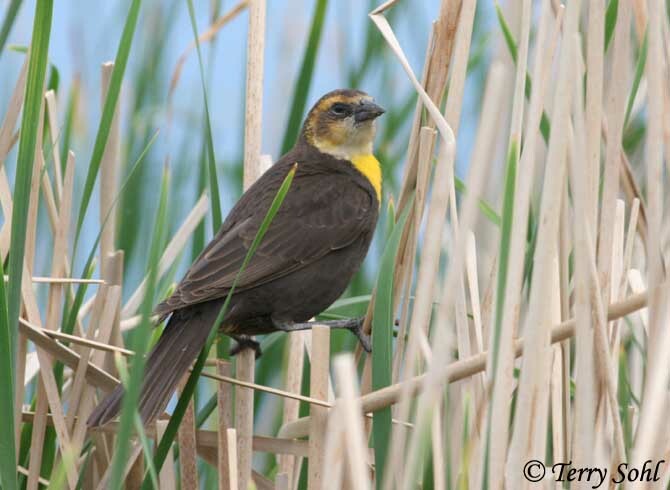 Freshwater sloughs, marshy lake borders, particularly those with cattail marshes or other types of wetland vegetation. 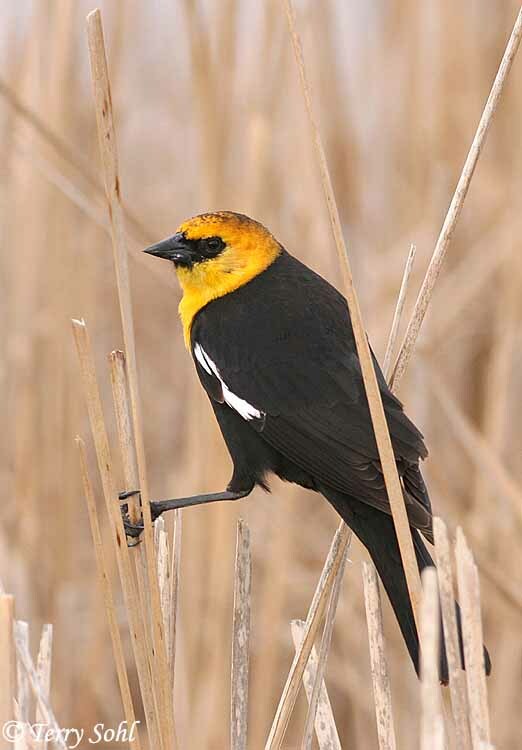 Feeds around marshes, farm fields, and feedlots, and can also be found in those habitats during migration and in winter. Mostly seeds and insects, with the majority of the diet likely seeds. 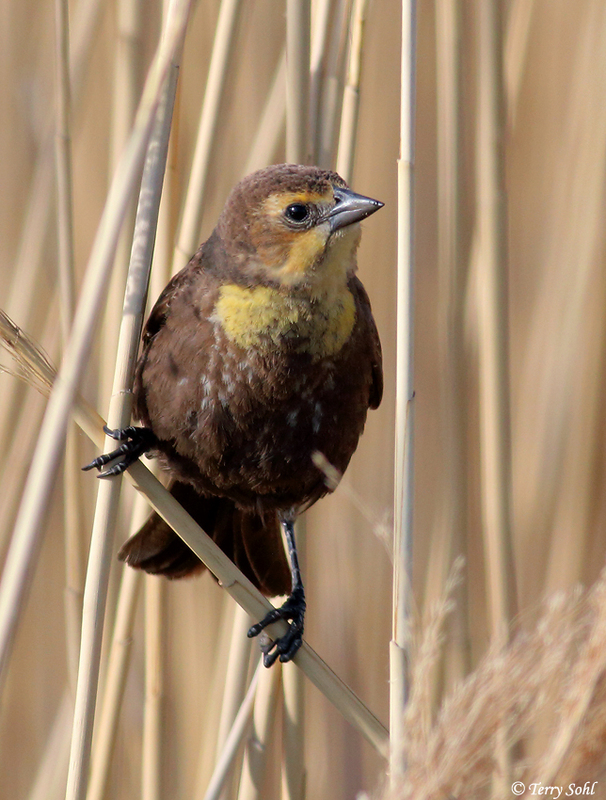 Very gregarious, usually nesting in colonies. 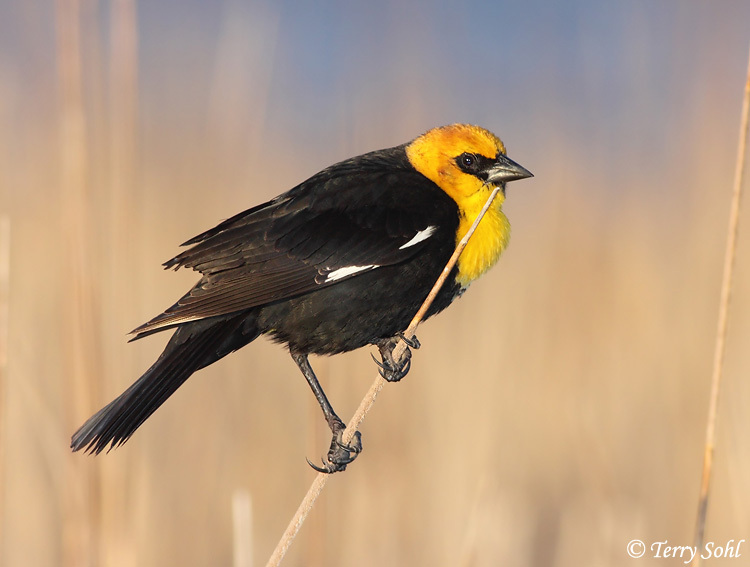 Often gathers in huge mixed flocks of blackbirds during the winter months and in migration. 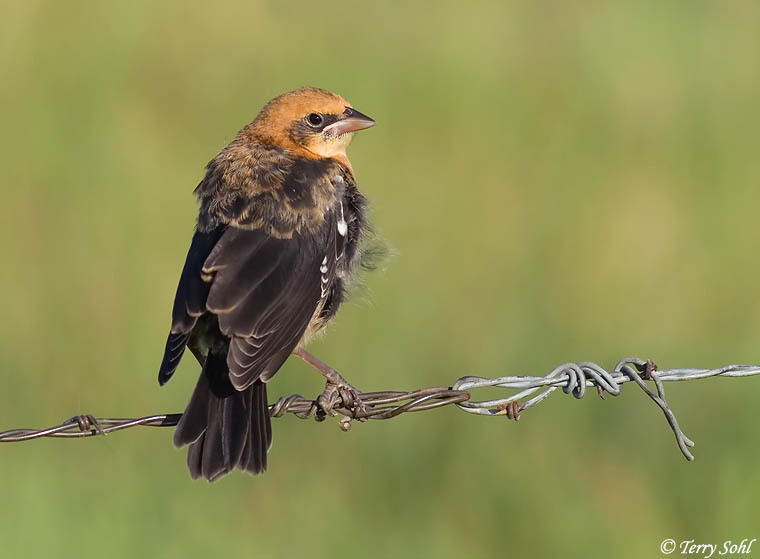 Feeding is done relatively close to the ground or on the ground itself, although they will also occasionally hawk insects in mid-air. Late May through June in South Dakota. 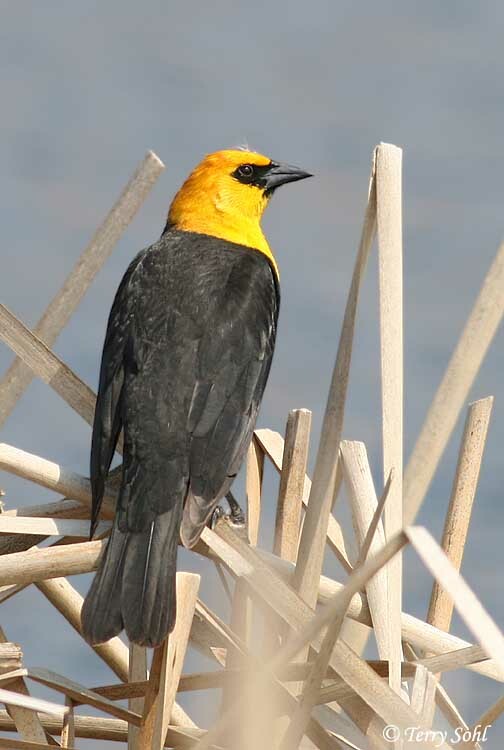 The nest is built entirely by the female and consists of a rather large, droopy basket woven among cattails or other wetland vegetation, suspended above the water. 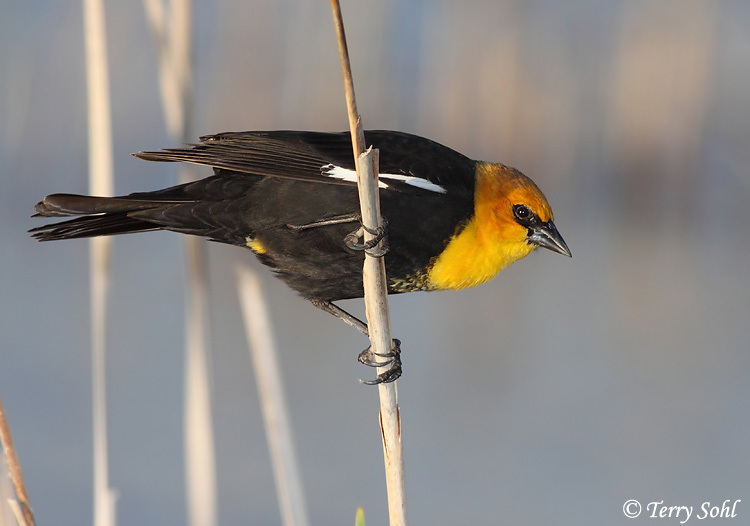 The female lays between 3 and 5 eggs. 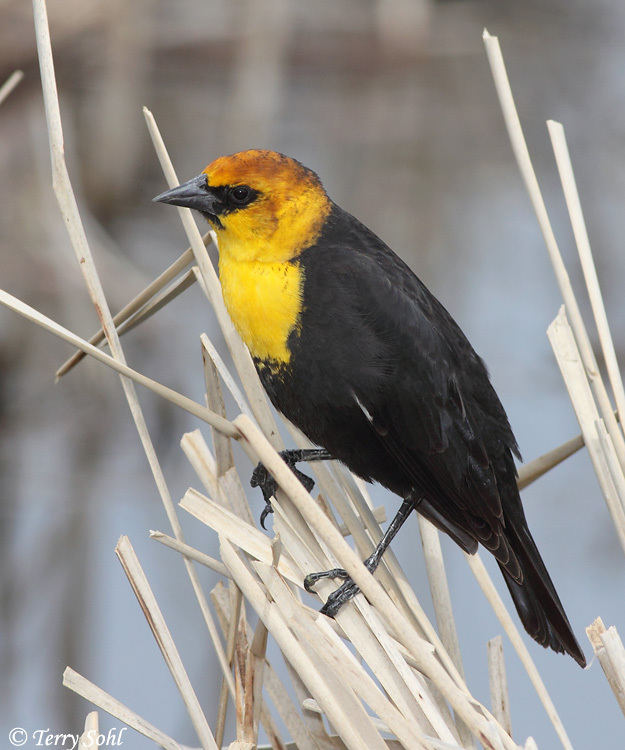 Incubation takes about 12 days, with the female alone incubating the eggs. 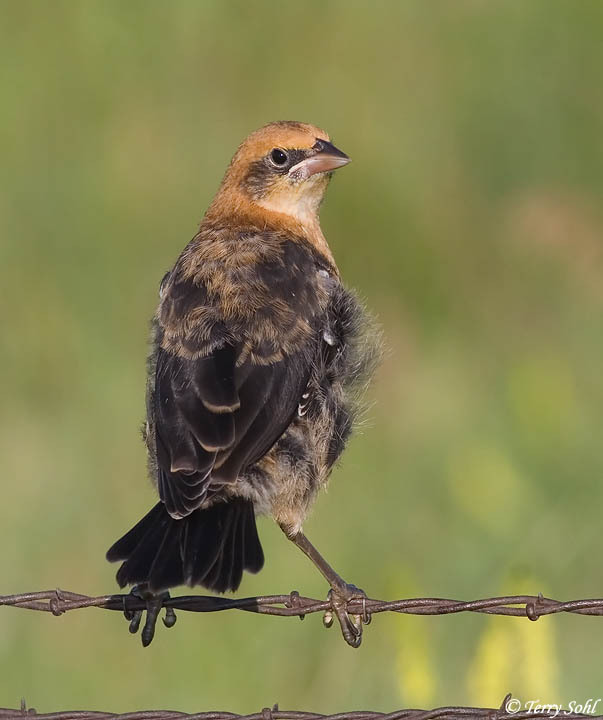 The young fledge from the nest about 10 to 14 days after the eggs hatch. Harsh, unpleasant song, with several crude warbling notes followed by a raspy ka-aaaaack. They also have short check calls. 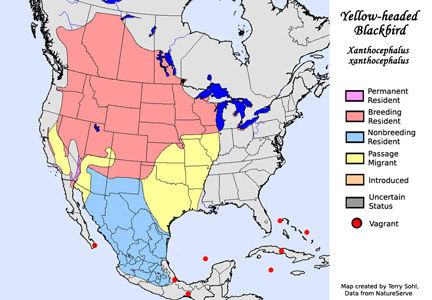 Neotropical migrant, wintering the southwestern U.S. through Mexico and Central America. Generally distinctive. 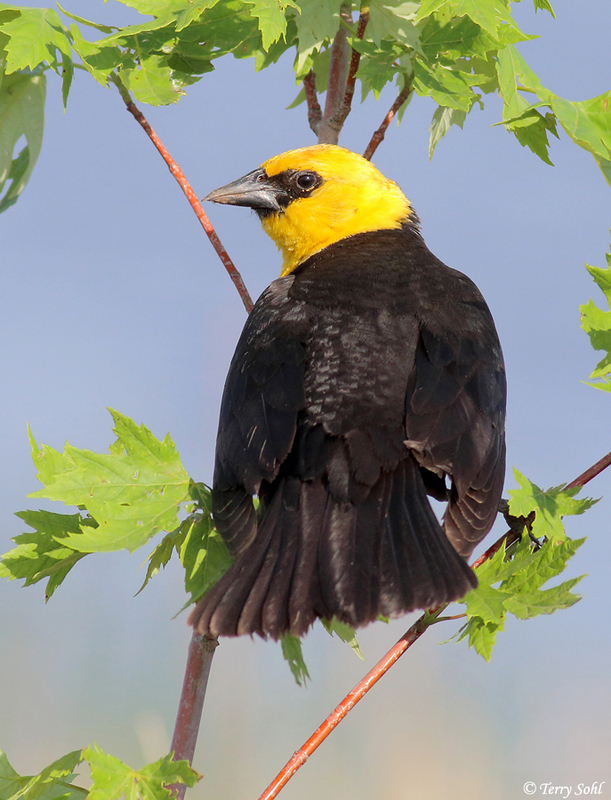 The male is the only North American bird with a black body and yellow head. 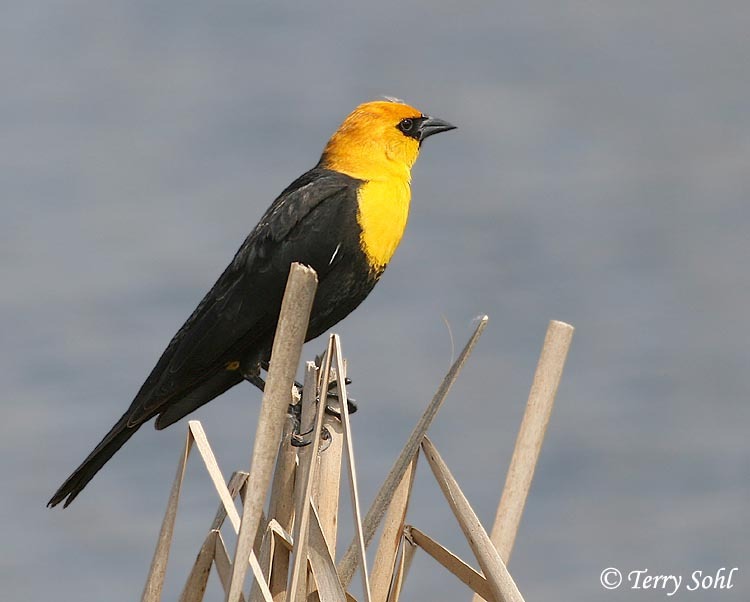 Yellow-headed Blackbirds are quite easy to find in suitable habitat in the state, particularly in the eastern part of the state. 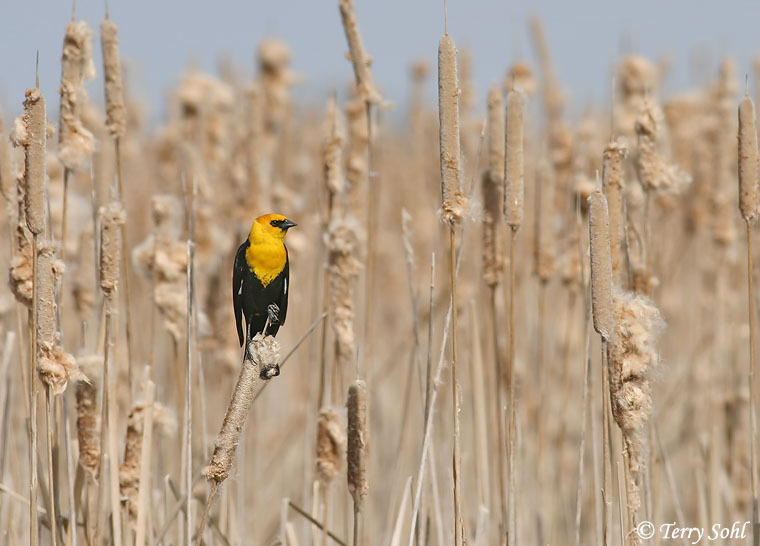 In the "Prairie Potholes" of eastern South Dakota, Yellow-headed Blackbirds can be found nearly anywhere there are extensive areas of cattail, including both the margins of very large water bodies such as Lake Thompson, as well as quite small wetlands and pond edges. 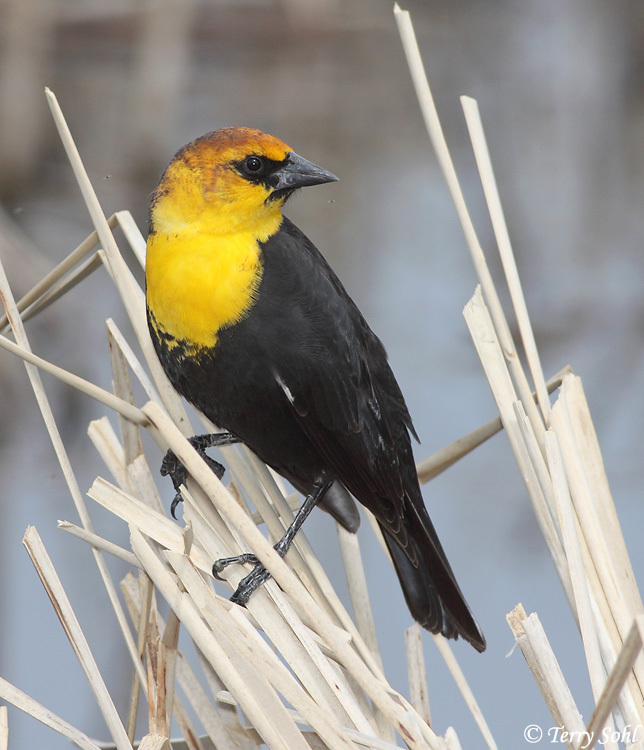 Near South Dakota's largest city of Sioux Falls, wetland habitats in western Minnehaha County always hold Yellow-headed Blackbirds from spring through early fall. 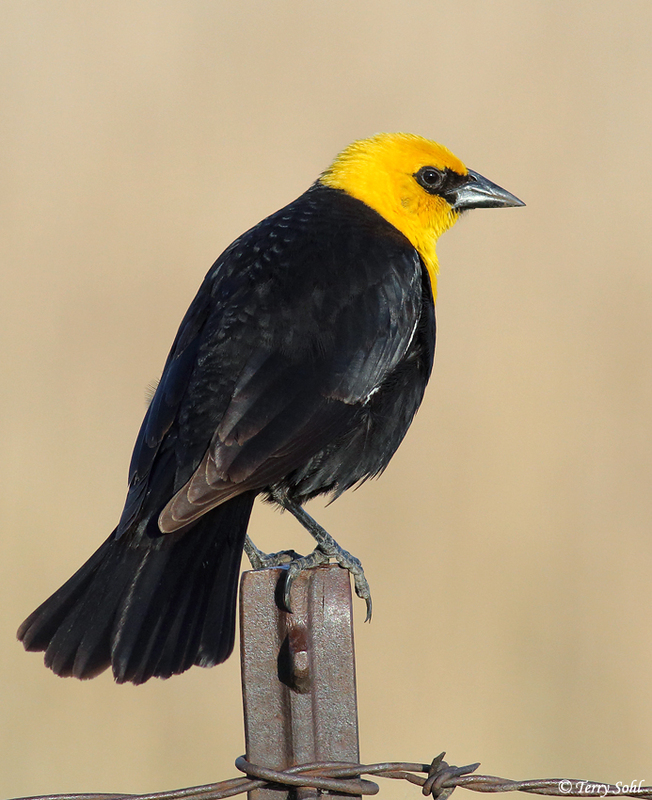 Given a feeder relatively close to their wetland habitats, Yellow-headed Blackbirds may attend feeders for suet, cracked corn, millet, and other seeds. 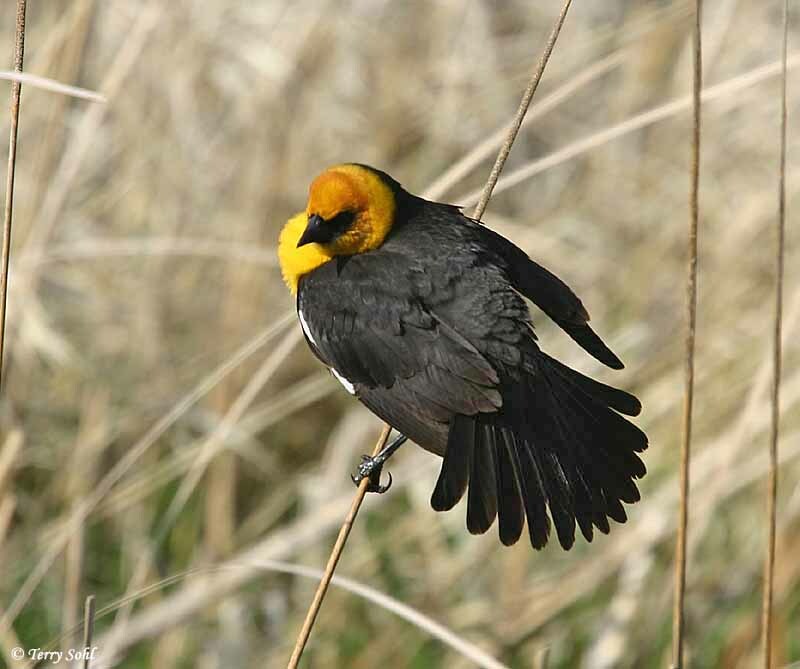 Generally stable throughout its range, although they are susceptible to habitat loss through wetland destruction. 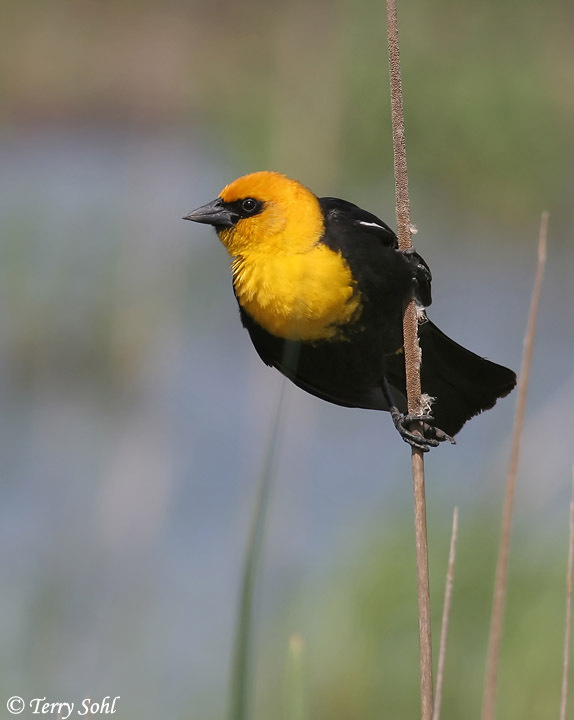 Despite the threats to their wetland habitats, numbers are stable or may even be increasing. 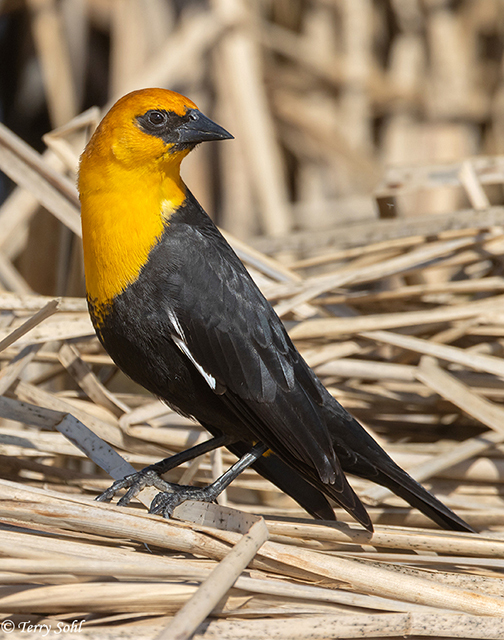 The IUCN currently considers the Yellow-headed Blackbird to be a species of "least concern". 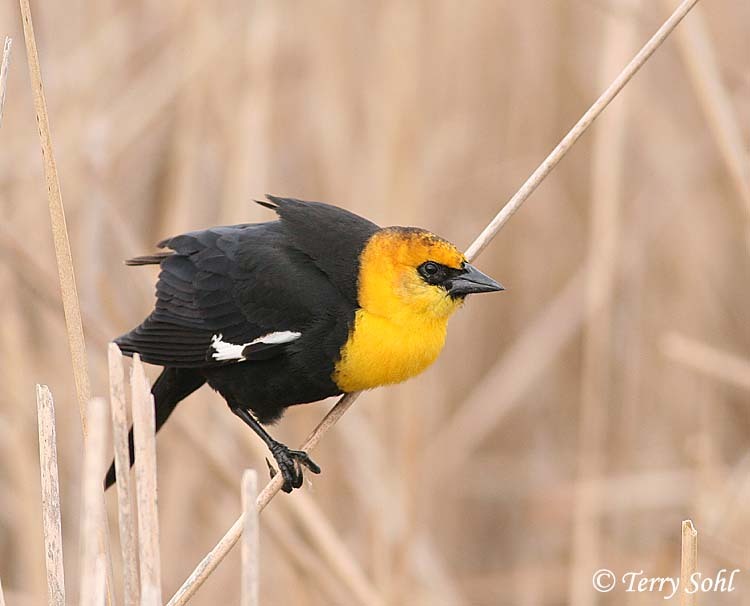 Click on the image chips or text links below for additional, higher-resolution Yellow-headed Blackbird photos. 1Michael Lester, XC253402. Accessible at www.xeno-canto.org/253402. 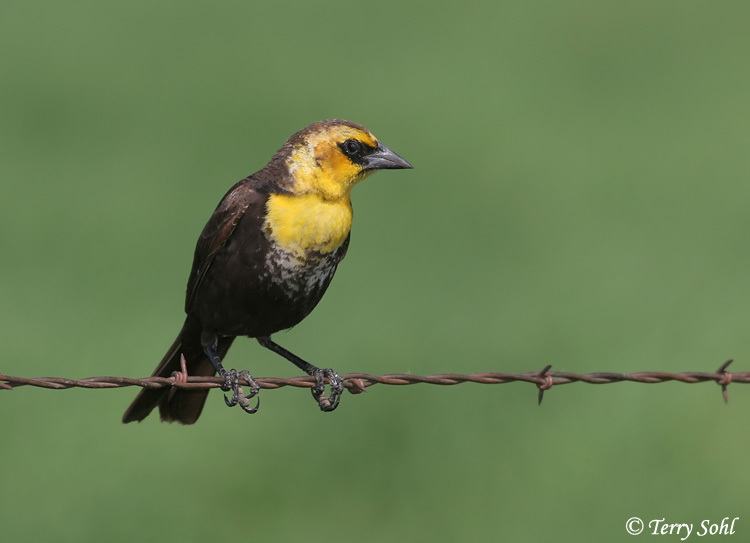 South Dakota Status: Common migrant and summer resident in suitable habitat throughout the state. Accidental in winter.